A Korean woman delivered dichorionic diamniotic twins 128 days apart. The last born twin survived and were doing well at the 1-year follow-up. A 29-year old Korean woman gave birth to dichorionic diamniotic (DCDA) twins 128 days apart. Her case was published in KoreaMed Synapse. KoreaMed Synapse is a digital archive of Korean medical journals. Her twins were at 16 weeks of gestation, when she contacted a local clinic due to leakage of amniotic fluid. She was diagnosed with a preterm premature rupture of membranes (PPROM). PPROM is when a woman’s water breaks during pregnancy before 37 weeks’ gestation. The Korean women was referred to Yeungnam University College of Medicine. An ultrasound showed that one twin had almost no amniotic fluid left. Three days after the woman was admitted to the hospital, she gave birth to a baby boy who died soon after, weighing only 100 grams (3oz). In the following days the woman received different medications such as anti-inflammatory drugs, antiseptics and antibiotics. The day after the birth of the first twin, she started showing signs of preterm labor. She had abdominal pain and irregular contractions. She received Ritodrine, a drug used to stop premature labor. Her condition gradually became stable, and she was discharged from the hospital at 25 weeks. The woman was admitted to the hospital again at 34+4 weeks, because her water broke, and she was having contractions. She delivered vaginally the following day. 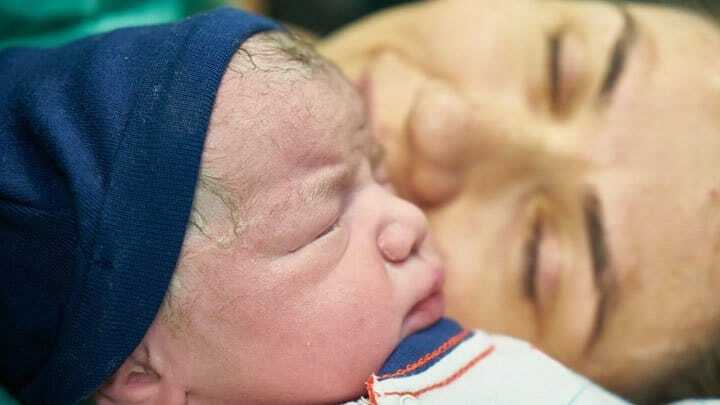 She gave birth to a healthy boy who weighed 2370 grams (5lbs, 3oz). The mother and son were discharged from hospital after 15 days, and during the 1-year follow-up period the baby was healthy and developing normally. This case of delayed-interval delivery in a twin pregnancy is the case with the longest interval period ever published in Korea. The researchers concluded several possible contributing factors to the long delayed-interval of delivery. 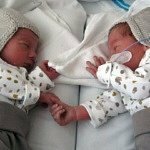 They concluded, that the chance of prolonging the birth of the second twin is greater if a loss happens as early in pregnancy as possible. Secondly, chorionicity plays a significant role. Dichorionic diamniotic (DCDA) twins are associated with a lower incidence of most complications, including preterm birth, than monochorionic twins. DCDA twins are twins that have separate inner and outer sacs. They each have a placenta. Read more about dichorionic and monochorionic twins. The researchers also believed that absolute bed rest was helpful. They stated that no study has investigated whether bed rest is effective in delayed-interval delivery of multiple pregnancies and acknowledged that bed rest has no significant effect on prevention of preterm delivery in singleton pregnancies. However, they stated that many researchers consider bed rest important and strongly recommend it to the mother when attempting to delay the delivery. They also stressed that strict hygiene, and daily use of vaginal antiseptics were helpful.